Nobody in this arts community has been a more enthusiastic advocate of the productions mounted by Fun House Theatre in Plano than me. I knew they would eventually open a show that I could not give a positive review to in good conscience. Here it is, based on Romeo and Juliet‘s opening night performance. Fun House has finally mounted a “TYT” production. Typical. Youth. Theatre. The play’s words or sense really don’t matter, so just mumble them as fast as possible, kids. Grandpa can snap a cute picture of his cherished grandchild acting like furniture in a cumbersome costume on a meticulously detailed, realistic set that offers obstructed views to audience members not seated down front in the center section. What was the name of that play, anyway? The one by that English guy who probably didn’t exist? The sweethearts die at the end. And music to accompany it? Non-stop, annoying piano riffing on a mournful tune composed for the 1968 Zefferelli movie adaptation completes the enterprise, often drowning out the mumbled-and-rushed dialogue. But cherished grandchild looks so cute in his/her physically restricting costume. Great photo material. 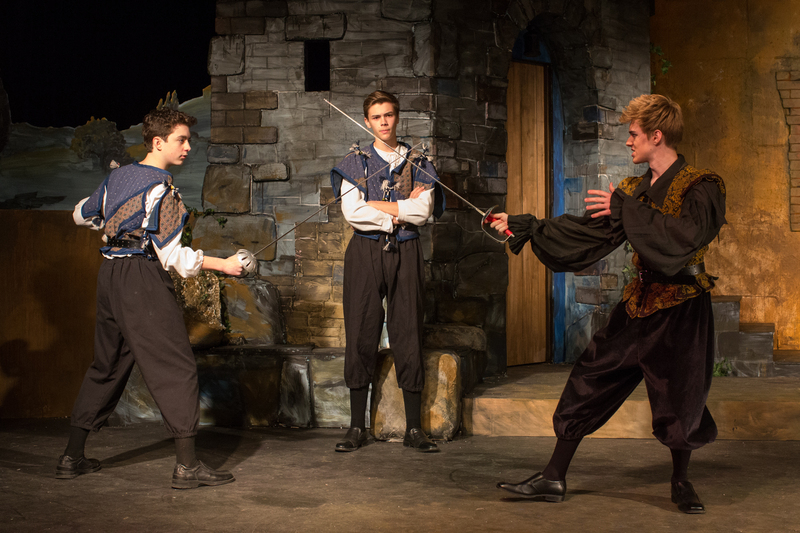 Glad they didn’t make the swordplay look authentic…somebody might get hurt. And thrilled they kept Romeo and Juliet fully clothed and “chaste” in the bedroom scene. Did you see the one kid dressed in purple as a court jester with a bouncy white feather in his hat? He looked so silly. Was it supposed to be a comedy? Snap another picture, gramps. Ugh. How I longed for the elegant simplicity and veracity presented in the Fun House Theatre “Hamlet” a few years back. It was one of the best “Hamlet” productions I’ve seen, ever; and I’ve seen MANY of them, by adults, some of them even professionals. Maybe it’s a mistake to attend Fun House shows on opening night. SET, SOUND, COSTUMES: Oh, dear. Clare Floyd DeVries’ set is exquisitely detailed in every way, as many of her architecturally envisioned and executed sets are. Freestanding set pieces, including the burial platform in the final scene, don’t tie in with the lush, painted flats and backgrounds. How they are positioned far downstage forces actors to perform in a static linear fashion, whether standing, fighting, sitting or lying down. Some important character’s face is inevitably not visible to the audience during crucial moments. What obliges designers to give Juliet’s balcony height every time they design this show? It doesn’t work if the venue ceiling is low and actors are tall. This production’s balcony seemed difficult for Romeo to negotiate (I worried he might sprain an ankle). When he finally clambered onto the balcony with Juliet, I found other concerns. His head was as high as the show’s lighting instruments. It almost brushed the ceiling’s electrical grid. Shadows on his face? You bet. Take me out of the scene? Yup. And the balcony was positioned at an odd angle that again prevented me from seeing both actors’ faces clearly in this very important scene. I moved to a more central seat for Act Two. That put me closer to the piano. Lord, help me. William Shakespeare’s incomparable writing does not need any sort of underscore, much less a soap opera drone that drowns out persistent mumbled-and rushed dialogue. I could have happily doused the pianist with another vial of Romeo’s poison. COSTUMES: Woe is me. I understand a company’s desire to dress its cast in elaborate costumes. This show’s fancy costumes seemed to restrict the natural ease of movement Fun House actors are known for. Doubtful if anyone coached the young women how to move or sit properly in their period garb, or showed the young men how to stand, turn or take command dressed as nobility. If you wear the full costumes, you should reflect their period in movement and carriage. The “stage combat” exhibited was as cheesy and unconvincing as I’ve seen in some time. I wondered if the actors were told “don’t you DARE rip these costumes” and thus turned the play’s ribald brawling into a Sunday afternoon croquet match. Once again, I recall the simplicity and power of Fun House’s “Hamlet”, the raging battles waged on stage with savory abandon. Where did it all go? Who selected a bizarre costume for Juliet’s noble suitor Paris? He is a prominent young nobleman, a worthy suitor. He is not one of Shakespeare’s famous clowns. So why is this production’s Paris attired in a ridiculous purple court jester costume, wearing a cap festively adorned with a bobbing white plume? I could have snatched it off his head on my way over to the piano to dispatch the piano player and continued with it under my arm to toss into the first available dumpster on my way out of the building. This critic was not a happy camper. Let’s talk acting. How clear can I be? Speed does not equal energy. Speed does not equal energy. Speed does not equal energy. Speed does not equal energy. With three prominent exceptions, EVERYONE in this cast did the mumble-and-rush jive. The famous “Romeo meets Juliet” scene spun along right out of Speed-dating 101. It reminded me of the eHarmony television commercial spoofing speed–dating events, with the guy made up like KISS at the end as a shocker. Then there’s the balcony scene with Romeo and Juliet’s heads lost in the lighting instruments and venue wiring. The morning after marriage scene? Mumble-and-rush. No eye contact, no lingering glances, clinging hands. No palpable reluctance to leave what peace and love had opened them to? Did they even kiss during the night, or did Romeo sleep on the floor, as content as a goofy, handsome puppy? The crypt scene? It’s supposed to be a dark crypt, full of dead ancestors and stuff like “damp contagion”. What lighting or set or prop changes indicated any of that? The speed-dating pair didn’t fit well on the narrow, raised burial platform provided, set awkwardly in linear alignment so faces weren’t always visible. I wondered if Romeo would simply fall off of it, or push Juliet off in attempting to join her there. 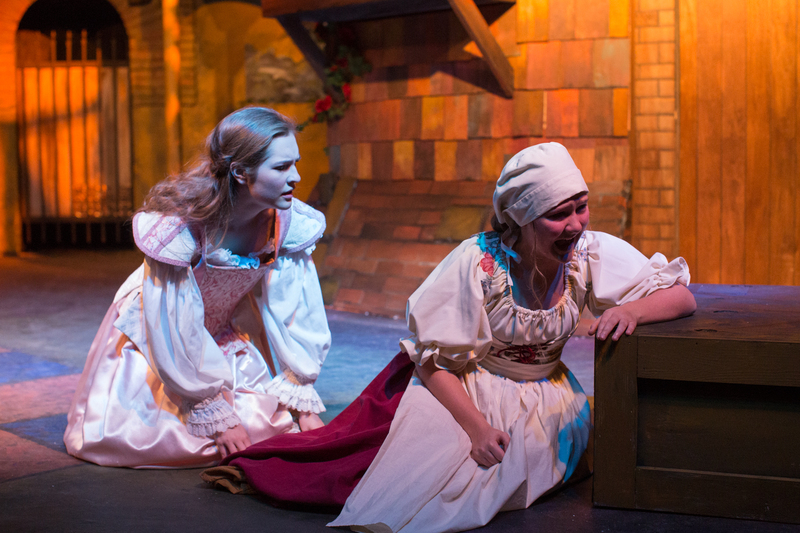 This is the play’s most dramatic scene, a let down in this production. I have seen both of these young actors do far, far better than this. 1) Chris Rodenbaugh, giving a fresh, well-enunciated, performance as the tortured Mercutio, gone WAY too soon from the play and this production, after Tybalt “pretend acts” to slay him. 2) Kennedy Waterman as Juliet’s Nurse, providing much-needed, appropriate comic relief while speaking her lines with decisive energy and clarity. Too bad she had to try to interact with performers who sat mostly expressionless next to her on stage, waiting for her to shut up so they could spew out their lines in mumble-and-rush fashion. Waterman seemed stuck delivering half-demented monologues more than engaging in scenes, except when exchanging barbs with Rodenbaugh’s Mercutio. Not her fault. 3) As Lord Capulet, Logan Beutel worked hard to deliver his lines with measured command and sufficient gravitas befitting a mature Lord. Honest effort. Occasionally his speech style verged into a funereal monotone, but you could understand his diction and intent very clearly. When he became angry with Juliet, he went too far in portraying rage; but at least there was some variety in his performance. As with the Nurse, if Lady Capulet and Juliet had reacted to his rage in a believable manner (not just sitting there waiting to deliver their lines), his anger would have seemed less over the top. Note to self: do not attend a Fun House Theatre production again on opening night. It was painful to watch. This review has been more painful to write. I know this must have been a difficult piece for you to write, Alexandra. Criticism is sometimes a strong medicine but it doesn’t have to be mean or destructive. I’m sure our mutual friends at Fun House will take it to heart (maybe after swallowing a couple of times) and appreciate this assessment of R&J.